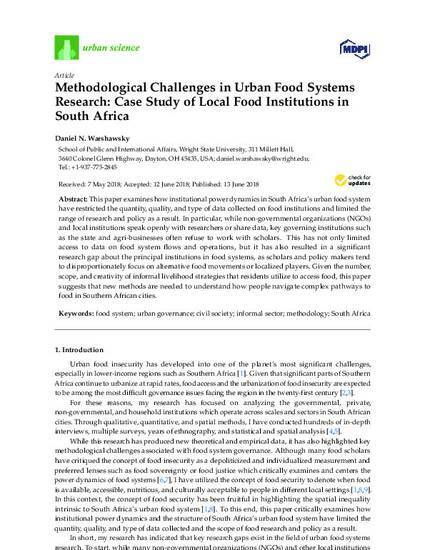 This paper examines how institutional power dynamics in South Africa’s urban food system have restricted the quantity, quality, and type of data collected on food institutions and limited the range of research and policy as a result. In particular, while non-governmental organizations (NGOs) and local institutions speak openly with researchers or share data, key governing institutions such as the state and agri-businesses often refuse to work with scholars. This has not only limited access to data on food system flows and operations, but it has also resulted in a significant research gap about the principal institutions in food systems, as scholars and policy makers tend to disproportionately focus on alternative food movements or localized players. Given the number, scope, and creativity of informal livelihood strategies that residents utilize to access food, this paper suggests that new methods are needed to understand how people navigate complex pathways to food in Southern African cities.